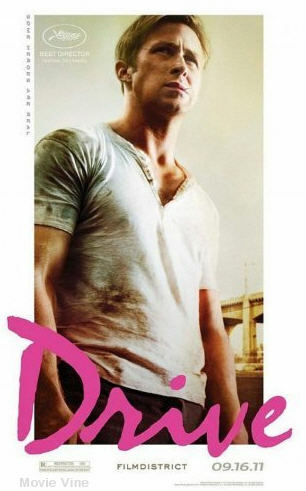 I’ll put this on the front street: I saw Drive over a week ago, and I’ve been chewing over this review the entire time. I haven’t been putting it off, but rather I’ve been trying to figure out how to approach this film when my feelings still haven’t quite settled. It’s an odd film, a weird mix of 70s Scorsese, Godard French New Wave, and Ford Western. The ambition to mix these three styles that organically grew from each other is laudable, and in a weird way this is a film America should be all over: a mix of the trashy action genre with high minded art house flair. Surely the culture that made Inglourious Basterds, Mad Men, and Breaking Bad such hits could find something to enjoy here. But something about Drive feels just a bit off. The film’s plot is nauseatingly simple: an un-named driver (played by Ryan Gosling) is socially inept but a master behind the wheel. He works at an auto repair shop and performs as a getaway driver for petty thieves on the side. He falls for his next door neighbor who’s fresh-outta-the-joint husband has a brilliant scheme up his sleeve, and the driver helps out. Things go awry (as they often do in films like these) and brutal violence ensues. Ryan Gosling is an actor I’ve never really cared for, but his nasally, Brando Wannabe delivery works well here. He’s a coiled snake for most of the film, wound up and ready to pounce at the right moment, but constantly trying to suppress it. For once I bought him as an actual character rather than a pouting mannequin with stellar abs, and his work here and in The Ides of March have me coming around on the pretty boy. One of the weirdest moments the film offers is when you realize you’ve been rooting for a sociopath for half the running time, and Gosling sells the moment beautifully. The rest of the cast is made up of amazing actors who deliver performances worthy of their reputation: Bryan Cranston (Breaking Bad) turns the one-note character of Shannon, the driver’s boss, into a wonderfully layered human being. Christina Hendricks (Firefly) makes the most of very little screen time and is the centerpiece of the film’s most memorable moment. Carey Mulligan (Never Let Me Go) does admirable work as the driver’s focus of affection. Albert Brooks (Finding Nemo) plays the heavy, and will surely win the Best Supporting Actor Oscar he should have won for Broadcast News. The film’s biggest problem is it’s pacing, which also sets it apart from mainstream American films. Watching Drive, you can just feel a European director behind the camera, and Nicholas Winding Refn revels in that. The opening titles are in a funky font. The soundtrack blares 80s tunes. Shots are held longer than any American editor would allow, and the storytelling takes its time to get going. The film starts of tense and taut but quickly loses its way, becoming a bit dull for those who can see the turns in the road up ahead. Those used to quick action of Greengrass, Bigelow, and Wright need not apply. Refn sets up his chess pieces and then slowly moves them about, pausing every now and then for some harsh violence. And make no mistake: the violence is harsh. Heads explode, or get kicked in. Hammers are wielded and knives slash crucial arteries. If overt violence makes you squeamish, I suggest sitting this one out. It’s not the most gruesome thing I’ve ever seen on screen, but it’s close. At the end of it all, Drive is mostly just plain frustrating. I wasn’t enamored by the film upon exiting the theater, but days later I’m still thinking about it. It’s still clicking around in my head, and as I continue to examine it from multiple angles I keep coming up with a beautiful, but flawed, work. It has some interesting things to say not just about the human condition, specifically our tolerance for moral ambiguity, but also how we take in film and other media; how we’re used to stories being told and what happens when someone refuses to bow to our expectations. There’s something to be said for a film that defies all expectations. This is a movie for people who love movies. I see roughly 100 new films a year. I’ve never seen anything quite like Drive. This is not an easy, breezy film that everyone can enjoy. To be honest that’s part of the appeal. This isn’t Moneyball, a crowd pleaser that will do very well this coming Awards season for that sole reason. Don’t get me wrong, there’s nothing wrong with those films, particularly when they’re well made, but those crowd pleasers fade from memory. Drive still rings clear. Every violent moment, every longing look is seared into my brain. If that’s not good cinema, I don’t know what is. Comments for Scorsese, Godard, & Ford: A “Drive” Review are now closed.